A pristine realization of GRAMMY nominated artist, Gentle Thunder, weaving her grand hammer dulcimer, Native American flutes and a taste of her percussion artistry. Share the embrace of spirit as she lovingly opens the gate and welcomes you home to her heart. 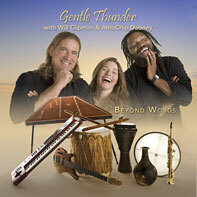 Look for Gentle Thunder LIVE in concert near you. Experience the distinctive sound of Gentle Thunder on grand hammer dulcimer, drums and Native American flutes, enveloped in the earthly pulse of Will's pan-global percussion and woven throughout are Amo's exquisite textures on piano, keyboard, bass and soprano sax. Join us LIVE in concert for an experience beyond words. Feel your breathing deepen as you relax into this expansive meditation of solo Native American flute music. Allow yourself to be gently guided into the mystery of your own unfolding. 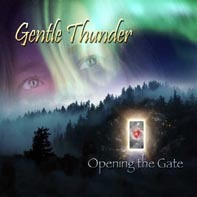 This album ON SALE direct from Gentle Thunder (see top of page) or iTunes. Like an exquisite rose, this music is soothing, passionate, inspiring, and deeply grounding. 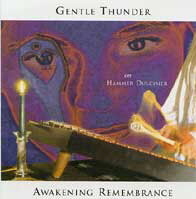 As the strings of the Hammer Dulcimer resonate, you will experience an opening, allowing you to relax deeply into connection with yourself and the magnificent web of life. 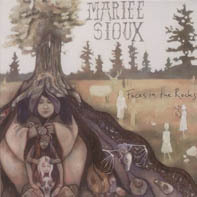 Mariee Sioux - "Faces in the Rocks"
Gentle Thunder is honored to join singer/songwriter Mariee Sioux on her debut album as a co-producer and offering her Native American flute and percussion artistry. This young artist is a pure hearted powerful writer whose dazzling debut album weaves together her strong yet sweetly cooing vocals, spry delicate finger picking guitar technique and the poetic interpretations of the universe’s deep truths and interconnectedness that have intrigued her since childhood. The contributions from all the other musicians including: her father Gary Sobanya-mandolin, Jonathan Hischke-bass guitar, Maggie McKaig-accordian, Luke Janela-cello, Lee Bob Watson, Jeremiah Conte, Dana Gumbiner-background vocals and engineer/co-producer Dana Gumbiner round out this record to make it a magical creation...truly a great record! Each spin invites listeners to be the cast in Mariee’s entrancing tale with a journey ahead that is only beginning. 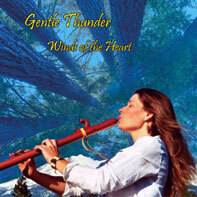 Amy Cooper guides the practioner through a yoga practice to the original Native American flute music by Gentle Thunder. 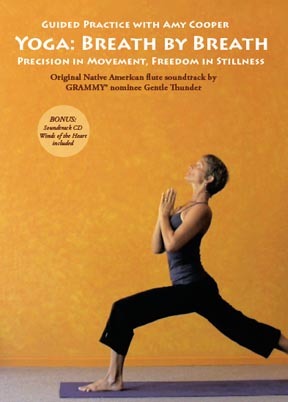 Precision in Movement, Freedom in Stillness is a guided, fluid, meditative and well-rounded yoga practice for beginning to intermediate students that includes an Introduction, Sun Salutations, as well as Standing, Seated and Relaxation posture sequences. This special DVD companion set retails for $24.95 and includes the full length soundtrack CD "Winds of the Heart". 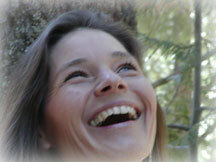 A true story by Pele Rouge about the power of love to transform ourselves and the world. In this 15 minute video, Pele Rouge tells the true story of her encounter with a bear in the mountains of southern Colorado in 2001. Told as a teaching story for all ages, the video is illustrated by breathtaking paintings by Outi Kuma and original music by Gentle Thunder. As wind blows through the hearts of the trees they sing, dance deep in their roots, become stronger and give the breath of life. Trees offer their give away for paper, for our homes, for heat, and musical instruments. It is my honor to offer the breath of life back to the trees, and all life, as I play my flutes, drum and hammer dulcimer from my heart and naturally complete the circle of the giveaway.